The Administration announced a new Space Policy in 2010, after a year of morale bending clouds of uncertainty. The lengthy delay, the abandonment of human exploration, and the wimpy overall thrust of the policy indicates that the Administration does not understand, or want to acknowledge, the essential role space plays in the future of the United States and of liberty. Antagonism against America’s demonstration of predominance in space continues. Expenditures of taxpayer provided funds on space related activities find constitutional justification in Article I’s power and obligation to “provide for the Common Defence.” This power relates directly to the geopolitical importance of space exploration at this frontier of human endeavor. A vibrant space program sets the modern geopolitical tone for the United States to engage friends and adversaries in the world as well as building wealth, economic vitality, and educational momentum through technology and discovery. For example, in the 1980s, the leadership of the former Soviet Union believed America would be successful in creating a missile defense system because we succeeded in landing on the Moon and they had not. Dominance in space clearly constituted a major factor leading to the end of the Cold War. With a new Cold War looming before us, involving the global ambitions and geopolitical challenge of the national socialist regime in China, President George W. Bush attempted to put America back on a course to maintain space dominance. What became the Constellation Program comprised his 2002 vision of returning Americans and their partners to deep space by putting astronauts back on the Moon, going on to Mars, and ultimately venturing beyond. Unfortunately, like all Presidents since Eisenhower and Kennedy, the Bush Administration lost perspective about space. Inadequate budgeting and lack of Congressional leadership and funding during Constellation’s most important formative years undercut Administrator Michael Griffin’s effort to fully implement the Program beginning in 2004. Delays due to this period of under-funding have rippled through national space capability until we must retire the Space Shuttle in 2011 without a replacement to access to space. Now, we must pay at least $63 million per seat for the Russians to ferry Americans and others to the International Space Station. How the mighty have fallen. Not only did Constellation never receive the Administration’s promised funding, but the Bush Administration and Congress required NASA (1) to continue the construction of the International Space Station (badly under-budgeted by NASA Administrator O’Keefe, the OMB, and ultimately by the Congress), (2) to accommodate numerous major over-runs in the science programs (largely protected from major revision or cancellation by narrow Congressional interests), (3) to manage without hire and fire authority (particularly devastating to the essential hiring of young engineers), and (4) to assimilate, through added delays, the redirection and inflation-related costs of several Continuing Resolutions. Instead of fixing this situation, the current Administration did not retain Administrator Griffin, the best engineering Administrator in NASA’s history, and now has cancelled Constellation. As a consequence, long-term access of American astronauts to space rests on the improbable success of an untested plan for the “commercial” space launch sector to meet the increasingly risk adverse demands of space flight. Histories of nations tell us that an aggressive program to return Americans permanently to deep space must form an essential component of national policy. Americans would find it unacceptable, as well as devastating to human liberty, if we abandon leadership in deep space to China, Europe, or any other nation or group of nations. Potentially equally devastating to billions of people would be loss of free nations’ access to the energy resources of the Moon as fossil fuels diminish on Earth. In that harsh light of history, it is frightening to contemplate the long-term, totally adverse consequences to the standing of the United States in modern civilization if the current Administration’s decision to abandon deep space holds for any length of time. Even its commitment to maintain the International Space Station using commercial launch assets constitutes a dead-end for Americans in space. At some point, now set at the end of this decade, the Station would be abandoned to the Russians or just destroyed. What, then, should be the focus of national space policy in order to maintain leadership in deep space? Some propose that we concentrate only on Mars. 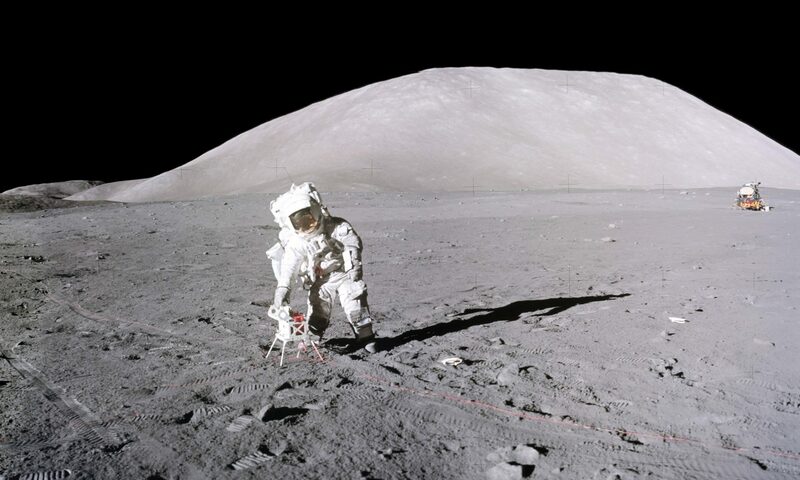 Without the experience of returning to the Moon, however, we will not have the engineering, operational, or physiological insight for many decades to either fly to Mars or land there. The President suggests going to an asteroid. As important as asteroid diversion from collision with the Earth someday may be, just going there hardly stimulates scientific discovery anything like a permanent American settlement on the Moon! Other means exist, robots and meteorites, for example, to obtain most or all of the scientific value from a human mission to an asteroid. In any event, returning to the Moon inherently creates capabilities for reaching asteroids to study or divert them, as the case may be. Returning to the Moon and to deep space constitutes the right and continuing space policy choice for the Congress of the United States. It compares in significance to Jefferson’s dispatch of Lewis and Clark to explore the Louisiana Purchase. The lasting significance of Jefferson’s decision to American growth and survival cannot be questioned. Human exploration of space embodies the same basic instincts— the exercise of freedom, betterment of one’s conditions, and curiosity about nature. Such instincts lie at the very core of America’s unique and special society of immigrants. Over the last 150,000 years or more, human exploration of Earth has yielded new homes, livelihoods, know how, and resources as well as improved standards of living and increased family security. Government has directly and indirectly played a role in encouraging exploration efforts. Private groups and individuals take additional initiatives to explore newly discovered or newly accessible lands and seas. Based on their specific historical experience, Americans can expect that benefits comparable to those sought and won in the past also will flow from their return to the Moon, future exploration of Mars, and the long reach beyond. To realize such benefits, however, Americans must continue as the leader of human activities in space. No one else will hand them to us without requiring a huge economic or political price. With a permanent resumption of the exploration of deep space, one thing is certain: our efforts will be as significant as those of our ancestors as they migrated out of Africa and into a global habitat. Further, a permanent human presence away from Earth provides another opportunity for the expansion of free institutions, with all their attendant rewards, as humans face new situations and new individual and societal challenges. Returning to the Moon first and as soon as possible meets the requirements for an American space policy that maintains deep space leadership, as well as providing major new scientific returns. Properly conceived and implemented, returning to the Moon prepares the way to go to and land on Mars. This also can provide an infrastructure for space exploration in which freedom-loving peoples throughout the world can participate as active partners. Again, if we abandon leadership in deep space to the any other nation or group of nations, particularly a non-democratic regime, the ability for the United States and its allies to protect themselves and liberty for the world will be at great risk and potentially impossible. To others would accrue the benefits—psychological, political, economic, and scientific—that the United States harvested as a consequence of Apollo’s success 40 years ago. This lesson has not been lost on our ideological and economic competitors. American leadership absent from space? Is this the future we wish for our progeny? I think not. Again, future elections offer the way to get back on the right track.